Chandler's first book and the introduction to the world of the famed private eye, Philip Marlowe, and established Chandler as the master of the 'hard-boiled' detective novel. The basis for the 1946 film starring Humphrey Bogart and Lauren Bacall, and an endless source of private eye quotes. ‘It seemed like a nice neighborhood to have bad habits in’. A lovely bright copy, and absolutely no sign of restoration, rare and honest as you can expect this ‘dust jacket’ to be in a world where its going out of style (apologies). Housed in a custom clamshell cloth case. Finely bound and with a mounted photograph of Tchehov and his wife, the actress Olga Leonardovna Knipper. The first complete authorised version in English of this collection which begins with ‘A Few Words About Tchehov’ by Olga Knipper-Tchehov, followed by 434 letters and telegraphs to Olga. ‘They met in September 1898 at a reading of his controversial new play, The Seagull. He was 38, she had just turned 30. He was a celebrated writer, she was a charismatic young actress in a fledgling theatre company. The story spans six short years, in which they play evolving roles - first as playwright and actress, then as lovers, then as husband and wife, and finally as invalid and caretaker, until Chekhov's untimely death at the age of 44. Most of that time they spent apart by necessity - she in residence at the Moscow Art Theatre, he in exile in Yalta, suffering from consumption. Even when they were together during the summers, his ever-declining health marred the quality of their reunions. And yet they shared more than a full lifetime of love and theatre. Dennis Wheatley’s copy, inscribed by Peter Cheyney ‘To my good friend Dennis’ and dated ‘14. 6. 38’. With Wheatley’s illustrated bookplate. A near fine copy of the first ‘Slim Callaghan’ novel, in fine and thus rare dust jacket. 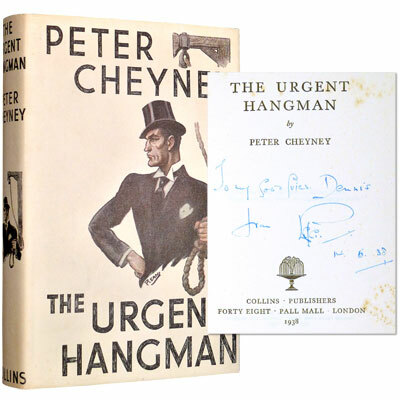 Cheyney’s action-filled and action filled plots ran counter to the comfortable murder mysteries of the time, and Slim Callaghan was, like his American hard-boiled cousins, cynical tough and marginally mannered. Finely bound first edition of this Poirot omnibus bringing together the first three Poirot publications, the two novels novels The Mysterious Affair at Styles and The Murder on the Links, together with the short story collection Poirot Investigates. Agatha Christie’s first novel, The Mysterious Affair at Styles, published in 1920, was the result of a dare from her sister Madge who challenged her to write a story. The story begins when Hastings is sent back to England from the First World War due to injury and is invited to spend his sick leave at the beautiful Styles Court by his old friend John Cavendish. Here, Hastings meets John’s step-mother, Mrs Inglethorpe, and her new husband, Alfred. Despite the tranquil surroundings Hastings begins to realise that all is not right. When Mrs Inglethorpe is found poisoned, suspicion falls on the family, and another old friend, Hercule Poirot, is invited to investigate. In Christie’s second Poirot ‘The Murder on the Links’, published in 1923, an urgent cry for help brings Poirot to France. But he arrives too late to save his client, whose brutally stabbed body now lies face downwards in a shallow grave on a golf course. But why is the dead man wearing his son’s overcoat? And who was the impassioned love-letter in the pocket for? Before Poirot can answer these questions, the case is turned upside down by the discovery of a second, identically murdered corpse. Poirot Investigates, published in 1924, was Christies third Poirot publication and her first collection of short stories. First there was the mystery of the film star and the diamond… then came the ‘suicide’ that was murder… the mystery of the absurdly cheap flat… a suspicious death in a locked gun-room… a million dollar bond robbery… the curse of a pharoah’s tomb… a jewel robbery by the sea… the abduction of a Prime Minister… the disappearance of a banker… a phone call from a dying man… and, finally, the mystery of the missing will. What links these fascinating cases? Only the brilliant deductive powers of Hercule Poirot! A finely bound first edition of this legendary title. One of the greatest locked-room mysteries, with one of the most original solutions. A crowning point in Christie's career, and probably her most high profile title, helped to that prominence by the success of the 1974 film of the same name, featuring among its cast stage and screen luminaries such as Albert Finney, Lauren Bacall, Sean Connery, Anthony Perkins, John Gielgud, and Ingrid Bergman, the last of whom won an Oscar for her performance in the film. About to be adapted again (2017) with Kenneth Branagh directing and starring as Hercule Poirot, together with Penélope Cruz, Willem Dafoe, Judi Dench, Johnny Depp, Derek Jacobi, and Michelle Pfeiffer. ‘An al-Qaeda bomb attack on a London soccer match provides the tragicomic donnée of former Daily Telegraph journalist Cleave's impressive multilayered debut: a novel-length letter from an enraged mother to Osama bin Laden. Living hand to mouth in London's East End, the unnamed mother's life is shattered when her policeman husband (part of a bomb disposal unit) and four-year-old son are killed in the stadium stands.’ – Publisher’s Weekly. ‘Arguably the strangest epistolary novel ever written’ – Newsweek. True first and limited edition issued two weeks before the trade edition. Signed by the author and with a typed note of thanks. 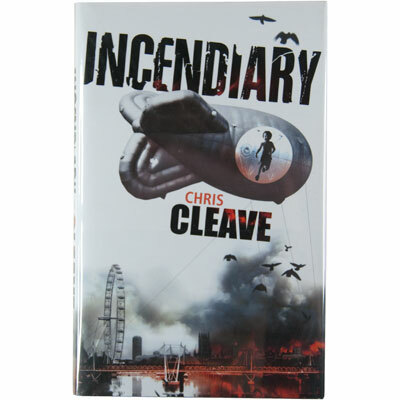 Unfortunately, it was published on the 7 July 2005, the day of the London bombings and most of the major bookshops removed it from their shelves. Presented with a charmingly illustrated front cover, this Queen's Quorum thriller features the adventures of the wonderful F.T. Carrington, the monocled young private detective ‘with a round, ingenuous, very agreeable face... a little neatly trimmed moustache’ – the inquiry agent, as he preferred to call himself. 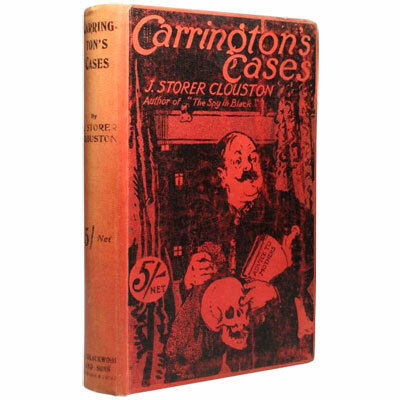 He tackles crimes and mysteries such as misplaced spouses, haunted houses, and medical misnomers, all done with Clouston’s trademark talent for absorbing plot, balanced with his deft hand for humour. ‘One of the most sought-after collections of detective short stories’ – Eric Quayle, Detective Fiction. A super set of Suzanne Collins’ phenomenally best-selling trilogy, the first two volumes signed by Suzanne Collins, Mocking Jay with the 2010 stamp of a Mockingjay and her signature (which was used instead of a personal signature due to a hand injury). Set in dystopian Panem, a place once known as North America, in a rich city called the Capitol, which is surrounded by twelve districts, the novels follow the adventures of 16-year-old Katniss Everdeen, who steps forward to take her sister’s place in the dark and brutal live television show, The Hunger Games.